Evidence from the dockets on the coffin of Ramesses II and also on a fragment from the coffin of Ramesses I, both found in DB 320, show that these kings had at one time been cached in KV 17 along with the mummy of the tomb's owner, Seti I. Dockets also reveal that all three kings had been removed from KV 17 on a date given as Year 10, 4 prt 17 of Siamun/Pinudjem II, and reburied three days later in another tomb referred to as the k3y ("high place") of Inhapi on Year 10, 4 prt 20. This tomb is further described as a "great place" (st c3t) and one in which "Amenophis rests," showing that Amenhotep I had earlier been cached there also. But where is the k3y of Inhapi located? Is it DB 320? Could it be one of the many unidentified tombs found throughout the Theban necropolis? Or is its location as yet unknown? Herbert Winlock and Elizabeth Thomas both believed that the k3y of Inhapi and DB 320 were one and the same. This view is supported by the fact that a wall docket at the bottom of the entrance shaft to DB 320 records that Pinudjem II was buried there on Year 10, 4 prt 20 of Siamun, the same date on which Ramesses I, Seti I, and Ramesses II were all reburied in Inhapi's tomb. This would seem to indicate that the necropolis officials had taken advantage of Pinudjem II's interment in DB 320 to conveniently cache the other mummies with him while the tomb was still open. John Romer's dating of the tomb to the late 17'th or early 18'th Dynasty also lends support to the idea that DB 320 could be the tomb of the late 17'th Dynasty queen Inhapi. Reeves disagrees with Winlock and Thomas, and argues that a consideration of the positions in which coffins were found in DB 320 shows that this tomb could not possibly be the k3y of Inhapi. He contends that Maspero's written reports concerning DB 320 indicate that the Antiquities director had probably drawn his account of the cache tomb's discovery from a common source, most likely notes composed by Brugsch at the time of the sepulcher's clearance, and concludes that Maspero's comments concerning the placement of objects in the tomb accurately reflect the distribution of the finds at the time of their official discovery in 1881. 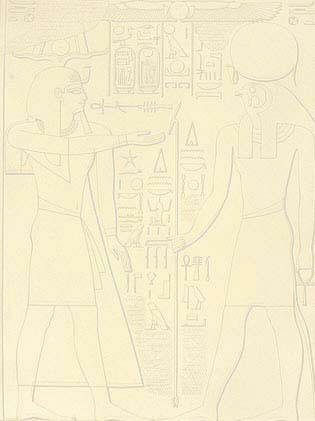 Furthermore, Reeves argues that the larger objects in DB 320 had probably not been disturbed by the Abd el-Rassuls, who claimed to have entered the tomb only three times during the ten years between their discovery of the cache and its official opening, and then only for the purpose of removing some of the smaller objects. Reeves points out that the large size and heavy weight of the coffins in DB 320 would have prevented the Abd el-Rassuls from moving them, and so believes that accounts of how the coffins were found by Brugsch when he first entered the tomb are, for the most part, trustworthy indications of the ancient distribution of objects in the cache. Maspero's earliest accounts of the discovery of DB 320 were published in the Bulletin de l'Institut Egyptien in 1881 and in his Guide du visiteur au Musee de Boulaq in 1883. In these, he states that the first coffin encountered near the entrance to corridor "B" of DB 320 (see tomb diagram) was that of a man named Nebseni. Maspero does not identify the owner of the second coffin found in corridor "B" but does date it on stylistic grounds to the 17'th Dynasty. Six years later, in his Momies royales, Maspero does identify this second coffin as being that of Seqnenre-Taa II. However, Reeves points out that Maspero, in the 1906, 1908, and 1915 editions of his Guide to the Cairo Museum, returns to his 1881 and 1883 accounts which do not identify the owner of this coffin. Furthermore, all of Maspero's accounts, with the single exception of the one in Momies royals, place Seqnenre-Taa II in side chamber "D" of DB 320. Consequently, Reeves believes that the 1889 identification of this second coffin as Seqnenre-Taa II's was a mistake which Maspero corrected in his later Guides. If not to Seqnenre-Taa II, then to whom did the second coffin encountered in corridor "B" belong? Reeves states that the only other coffin of 17'th Dynasty appearance found in DB 320 was that of the Lady Rai, which contained the mummy of Inhapi. (For a photo of Ahmose-Inhapi's coffin, see Ian Bolton's Egypt: Land of Eternity site.) He also makes the observation that Inhapi would certainly occupy a more central location in DB 320 if this was her tomb, and would not have been placed in a corridor, resting one coffin away from the tomb's entrance. Additionally, the mummies of Seti I and Ramesses II (and the coffin fragment of Ramesses I), which are known to have been cached with Inhapi in her tomb, were found at positions located farther into the tomb than hers, indicating that they had been placed in DB 320 before her. Reeves explains that this sequence of coffins and mummies is logical on the assumption that they had all been removed from a tomb in which Inhapi's burial had been central. The mummies would have been introduced into DB 320 in the order in which they had been removed from Inhapi's tomb. Based on these considerations, Reeves concludes that DB 320 cannot be the k3y of Inhapi referred to in the dockets. He believes the fact that Pinudjem II was buried in DB 320 on the same date that Ramesses I, Seti I, and Ramesses II were cached in the k3y of Inhapi is purely fortuitous. Reeves bases his theory on several presuppositions. Setting aside questions concerning the possibility of accurately reconstructing the ancient placement of coffins in DB 320 (and these are serious questions) the most central assumption in his argument is that Inhapi was the second mummy discovered in the entrance corridor of DB 320. As we have seen, Reeves contends that her mummy should have been more centrally placed in the tomb if it were her original place of burial. However, the fact that Maspero does not name the second mummy in his original accounts is interesting, especially in view of the fact that Inhapi's mummy was clearly labeled with a Type A Linen Docket. As noted, Inhapi's mummy was found in the coffin of the Lady Rai, and one could argue that the lid was probably closed when the tomb was first entered, thereby concealing the docket identifying Inhapi. However, one must now ask why Maspero did not identify the owner of the coffin as the Lady Rai? He gives the names on other coffins found in DB 320, and one would assume that he would have given the name of Lady Rai had it been inscribed on this second coffin. Of course, Maspero might have seen both the coffin inscription and docket identification, and have decided not to identify the mummy until the discrepancy was resolved through later investigation. But it may also be the case that the second coffin found in DB 320's first corridor was not Lady Rai's, as Reeves contends. Even if the second coffin did contain the mummy of Inhapi, a reconstruction of events different from the one Reeves provides can also be given which explains the non-central placement of her mummy. Assuming that DB 320 was Inhapi's tomb, as Winlock and Thomas believe, might it not be the case that she was removed from end chamber "F" by Pinudjem II so that he and other members of his immediate family could occupy a place of honor in the burial chamber themselves? The main problem with this theory is that we know that Ramesses I, Seti I, and Ramesses II were cached in Inhapi's tomb on the same day that Pinudjem II was buried in DB 320. If DB 320 was the k3y of Inhapi, it seems safe to assume that the three 20'th Dynasty kings would have been found in, or closer to, end chamber "F" than they actually were. There is also no rule that coffins must be placed in a cache tomb in the same order in which they were removed from a previous place of interment, and Reeves puts a lot of weight on coffin placement when he argues that DB 320 is not Inhapi's tomb. Since mummies are often found in coffins which did not originally belong to them, we know that the restorers often got things mixed up, and were probably equally likely to rearrange the positions of those coffins inside a cache tomb in ways that would not always make logical/archeological sense.